Made was a project connecting emerging designer and artists to learn both hard and soft skills in cultural production. Below is a recap of the project by participant Samantha Bite. The project kick-off began the beginning of June with a number of full day workshops to allow the six young artists and designers to get to know one another. The first full day meeting was an introduction and each artist presented past work, influences and future goals to one another. Other workshops included a skills based workshop involving ‘Little Bits’ which are easy-to use electronic building blocks the can allow the artists to brings sound, movement and various other dimensions into an art project. The 6 artists were separated into two teams of three to design a shadow puppet and secondly a design of choice using little bits. For the project of choice each group choose wildly different paths. The first created a ‘machine to make bubbles’ which used a motor, led light, red plastic cup, paper place and bubble soap. The plastic cup would lower into the bubble soap, return up and wind would blow through a hole to create a bubble that was illuminated by light. The second project took the form of a performance sound piece. Each member created a sound piece and costume and they then performed. SPSI from Art Engine on Vimeo. Shadow Monster from Art Engine on Vimeo. Breathing Machine from Art Engine on Vimeo. After the Little Bits workshops the project switched from skills based and into collaboration and design of the submission for the Maker Faire. 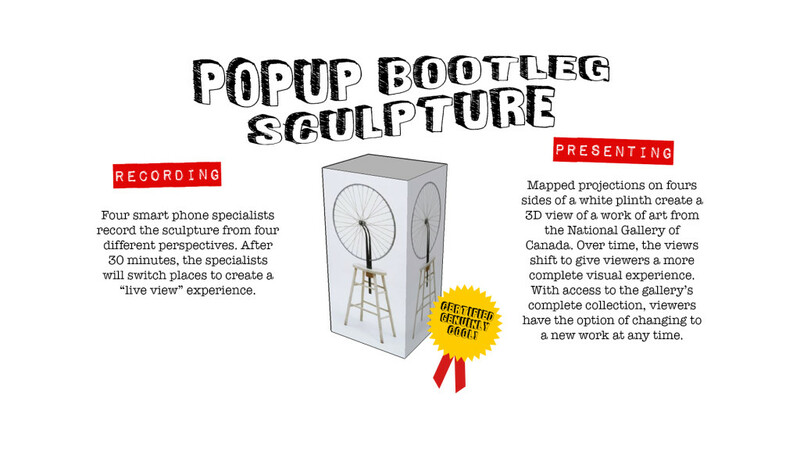 The structure of the design process included each artist bringing forward a number of ideas (usually 3 -5) ranging from an interactive wall, objects that unmake themselves, a face painting machine and a soundscape. The group selected 6 ideas to develop further individually. Each member brought forwards sketches, both digital and hand drawn, models and text to support their ideas. An informal presentation and discussion on both the deliverables and feasibility took place. This provided the artists with feedback on how to further strengthen their presentation and pitch of an artistic idea. A more formal meeting then took place with professors form University of Ottawa and Carleton as well as artist in the community. Each student presented the same idea with a few changes from the previous presentation. Although somewhat of a critique this meeting also provided an interesting discussion and dialogue between the young artist and those present. Discussion topics included what it means to make, do we make for the audience or ourselves, how we must think of the setting in which the art with be displayed, etc. In the end the soundtrack idea was chosen. 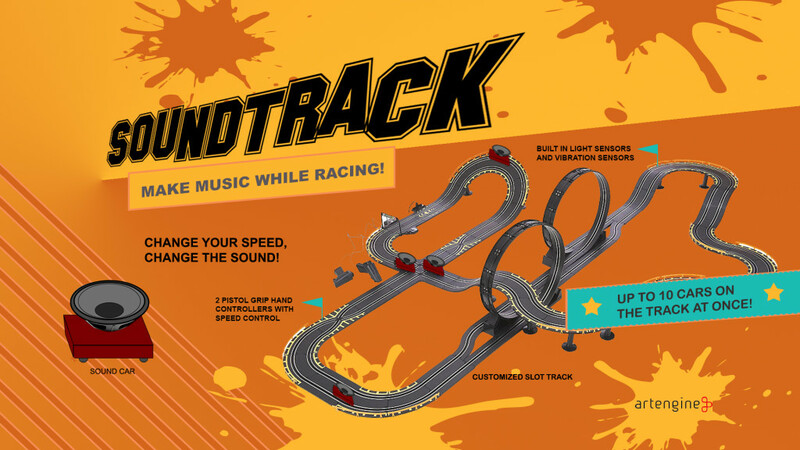 This idea uses the base of a slot car track and car to create noise. Each car has an associated noise and when moving about the track makes the noise. Depending on the speed the noise can change. Rather than it being a simple race the ‘drivers’ can work with each other to make a sound track. Each member felt as though the project would fit well into the atmosphere of MakerFaire and add an element of fun while still being a critical art piece. Research into slot car racing, track size and numerous variables took place individually and in groups. 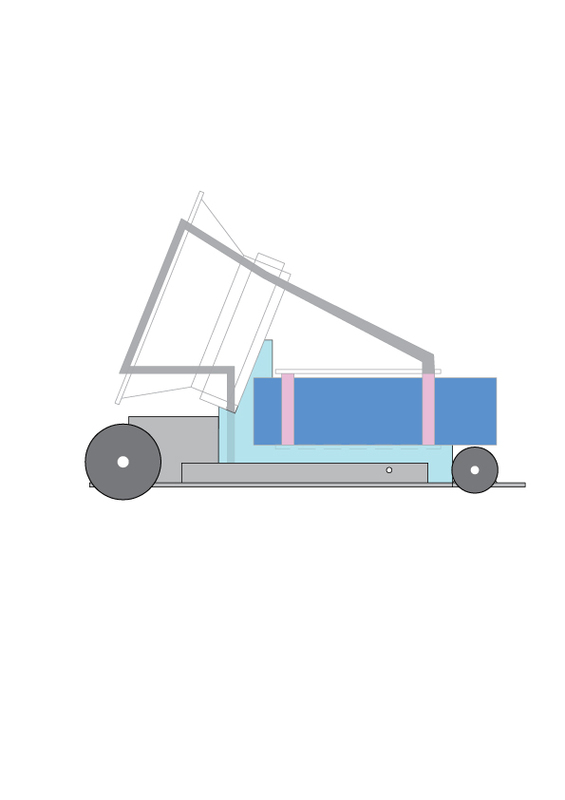 Once a design was drawn up using AutoCad and modelled in Rhino 3D software the group was able to decide on materials and colours. 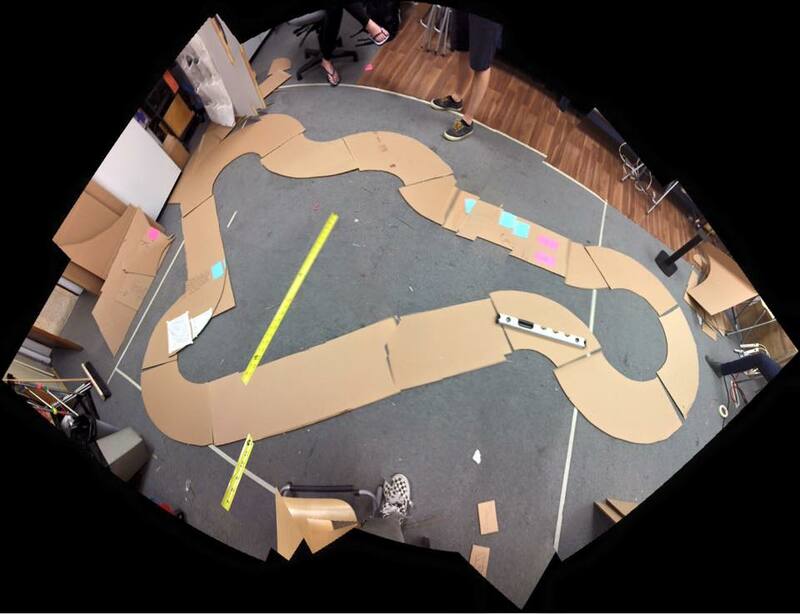 A 1:1 draft of the track was created in cardboard first before the final track was cut with wood. 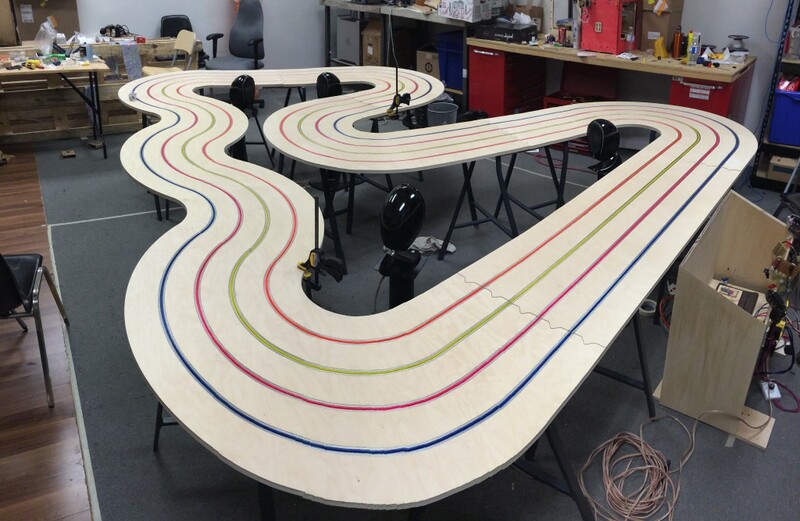 The track was made using wood in which groves for the slot cars were created with a cnc router. The group then came together to paint the track white and the individual slots 4 separate colours. This entry was posted on Monday, December 14th, 2015 at 2:52 pm	and is filed under Ryan Stec, Artistic Director. You can follow any responses to this entry through the RSS 2.0 feed. You can leave a response, or trackback from your own site.